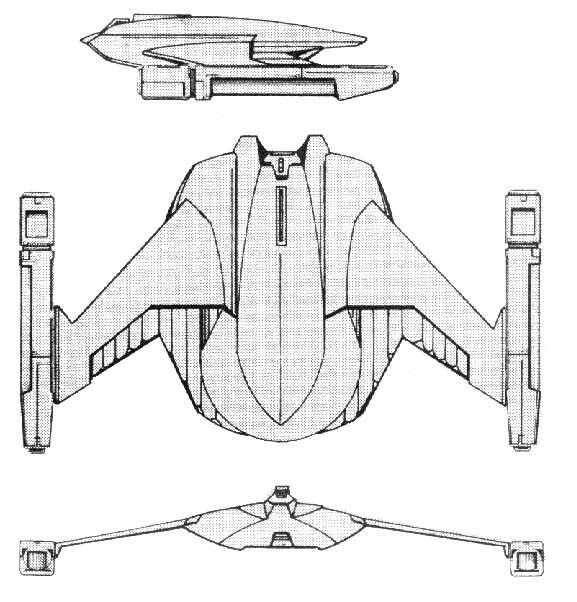 The S-9 Class probably was designed to replace the older S-4 (Swift Wing) as a front-line scout vessel capable of combat and exploration duties. The inadequate weaponry of its predecessor corrected by the addition of more powerful disruptors and more efficient shields, the Type 1 was a vast improvement. The Type 4 mounts two banks of two disruptors, giving the scout a better field of fire and increasing its combat efficiency beyond that of the CS-2 (Graceful Flyer), which it is believed to have also replaced. The class reportedly leads the Romulan expansion efforts spinward. Of the approximately 450 vessels built, about 400 are reported to remain in active service and about 20 have been placed in reserve fleets. Best estimates now give 19 Type 1s operating in the civil sector; plans for a vessel now believed to be one of these have been purchased from Orion sources in the Triangle. This class is named for ralas Mosarum (Wind Carrier), an ancient Romulan chieftain said to have carried the winds of Romulus with him as he traveled his territories. This leader supposedly waited to attack his enemies until storms were brewing in the area, and then would lead his armies into battle in the vanguard of the winds and rain. Power Units Available – 12 ea. 12 ea. 12 ea. 11 ea. 11 ea.